After several months of living at the outskirts of Dandelion Creek in a small tent, Primrose Keats decided to finally tackle the job of planning her and her fiance Patrick’s wedding. 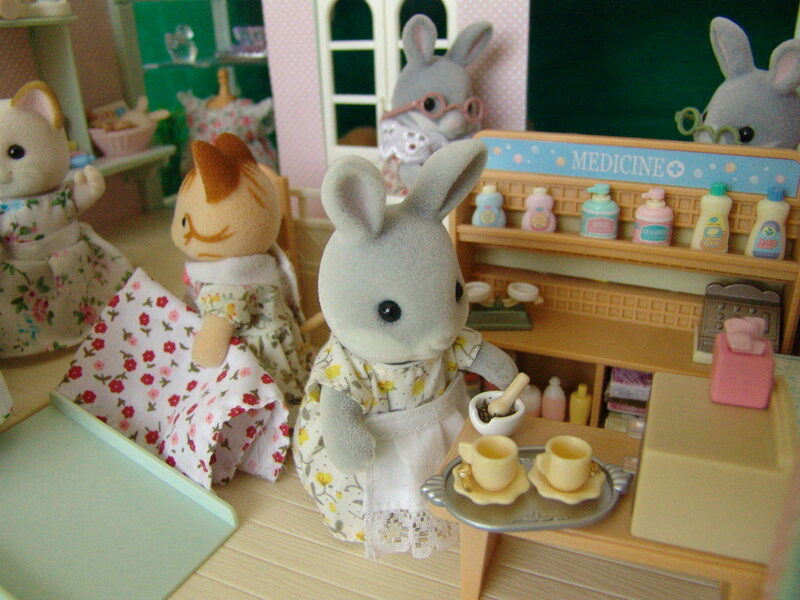 Today Primrose had decided to select her wedding dress and the outfit for Patrick at the local Country Market. 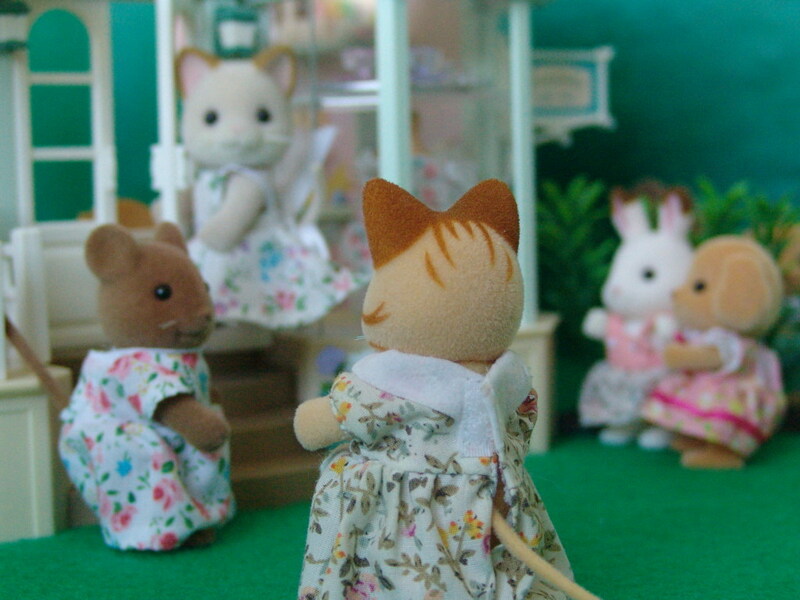 She met her best friend Tabitha Hazlewood in front of the small shop. As she was about to enter, Evangeline Beaman called out to her. 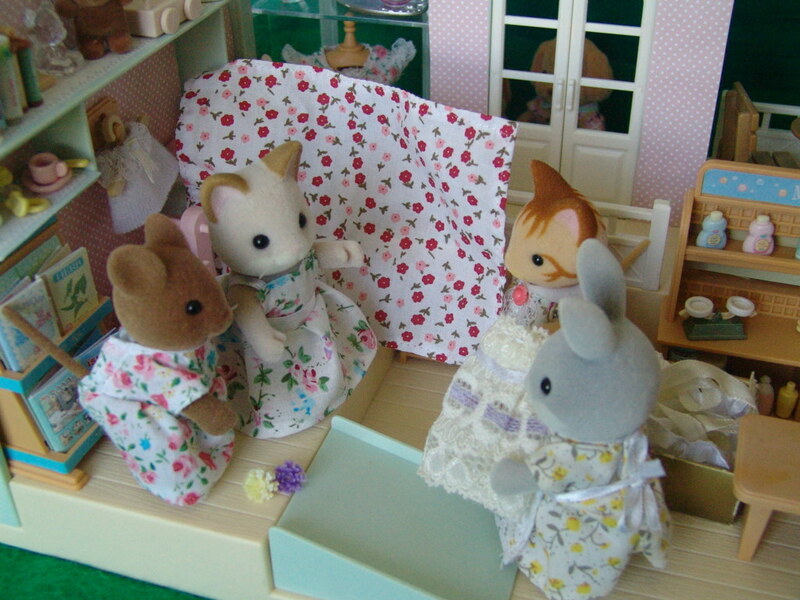 “I am going to help Primrose select her wedding dress!” Tabitha replied happily, she could remember just what she had felt when she chose her wedding dress. “No, not at all, in fact, I do like the fact you have brought some friends, it help when you have others who can help you make decisions.” Sorrel responded quickly, she then pulled out a box labeled ‘wedding clothes’. Evangeline pulled out a blanket which she had found to give the soon-to-be-Mrs.-Dante some privacy while she was getting changed as the shop bore no curtains. She held one end while pinching the other end between a pink rocking horse and one of the shelves on which stood a range of bathroom accessories. Tabitha in the meanwhile was trying to calm down her friend who was fidgeting nervously. Sorrel had gotten out a dress for Primrose to try on. Tabitha pulled out a blanket from the newborn baby section and handed it to Sorrel who held it up. 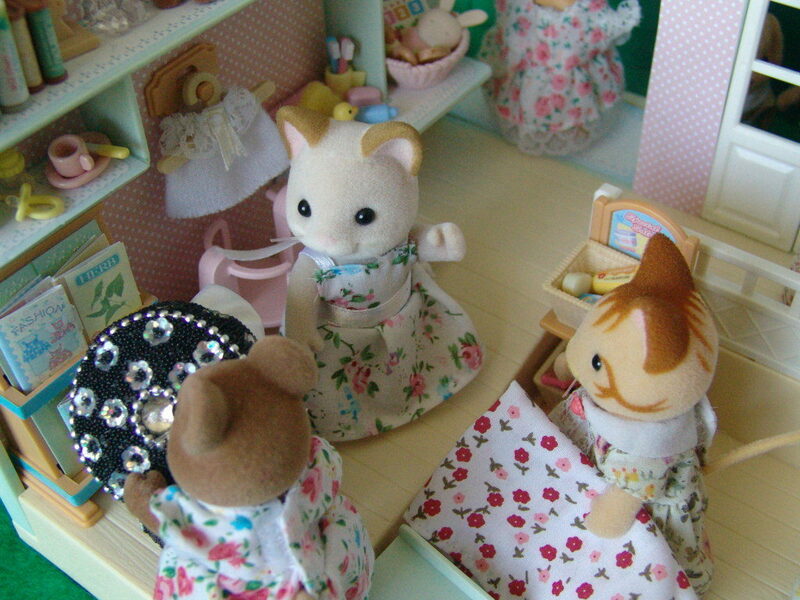 Primrose tried on the dress and got Tabitha to do up the back and tie the ribbon. Primrose’s smile faded as she looked down at herself, the dress didn’t look quite right on her, the colour of it made her fur look dull. “Can I have a mirror?” Primrose asked as soon as the dress was securely fitted. One look told her that this was not a dress to get married in. This was a dress to wear into a fancy town but not to wear when getting married. The colour and design also clashed with her carefully chosen colour scheme of cream and purple. Sorrel meanwhile had another good look when she found a box which contained a dress, completely white and made out of silk. It was a wedding dress which Sorrel had been gifted when she had gotten married all those years ago but hadn’t worn. 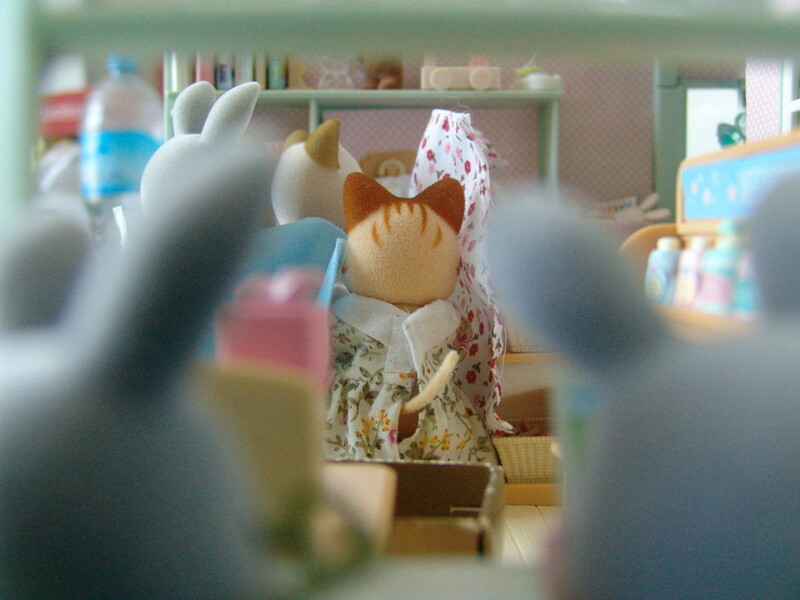 Two figures stood outside the service window and peered in at the happenings in the shop. “Sorrel darling? 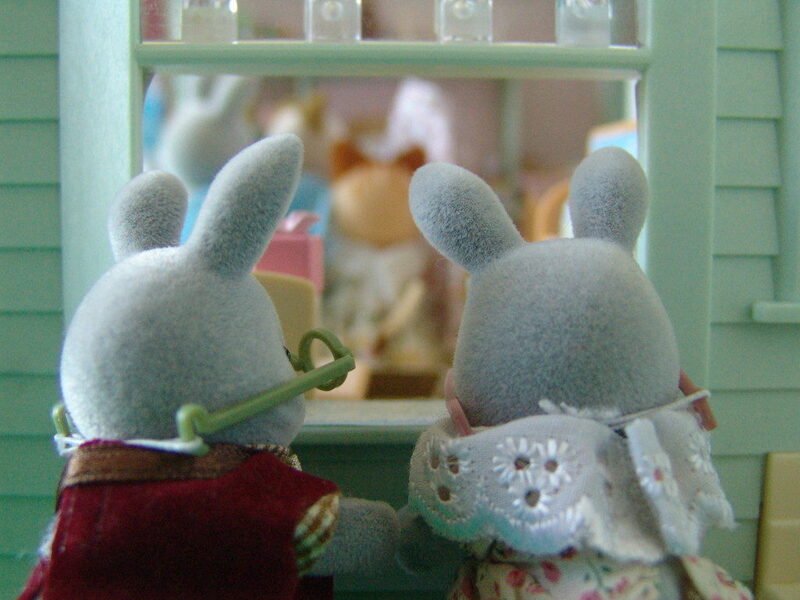 !” Catherine Cottontail called to her daughter through the window. 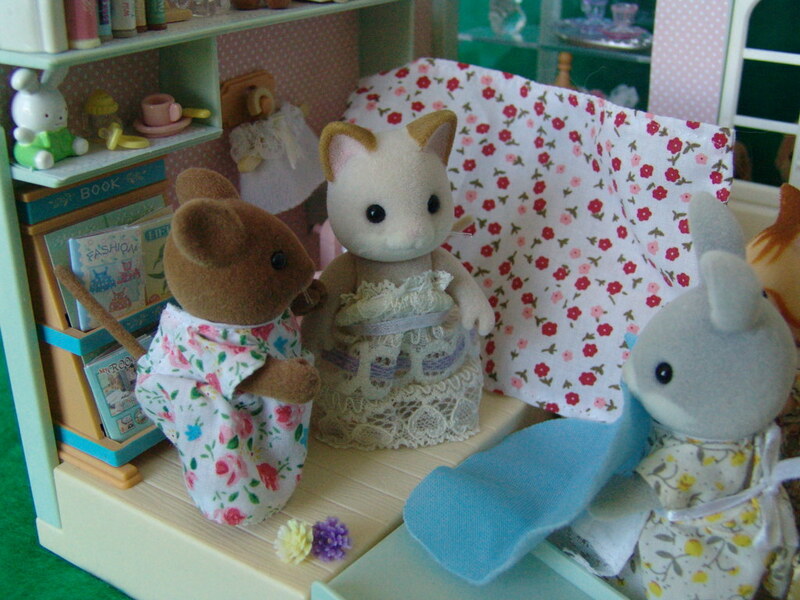 “Yes Mother?” Sorrel responded and held the blanket up for Primrose to change. 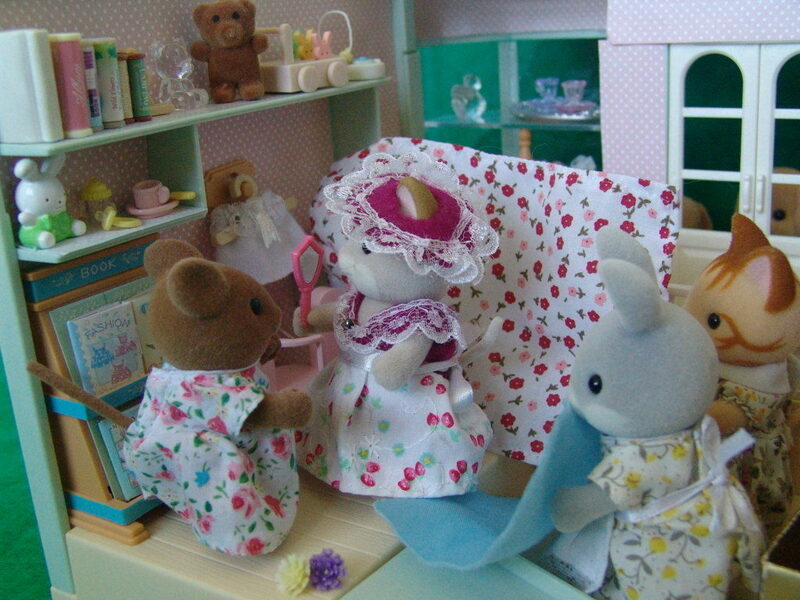 Primrose had decided on the last gown which made her look absolutely stunning, she could hardly wait for the wedding. While Evangeline helped to smooth down her ruffeled fur, Tabitha placed the dress carefully into a prettily decorated black box. Sorrel in the mean time was grinding and mixing together the herbal healing tea for her parents. Dried peppermint, daisies, roses, thyme, basil, lavender oil and many more things were combined. Just then Evangeline announced that it was time for her to go as she had overseen the time and now her husband had come looking for her. He greeted the ladies politely before pulling his wife out the door, carrying the black box containing the wedding dress. 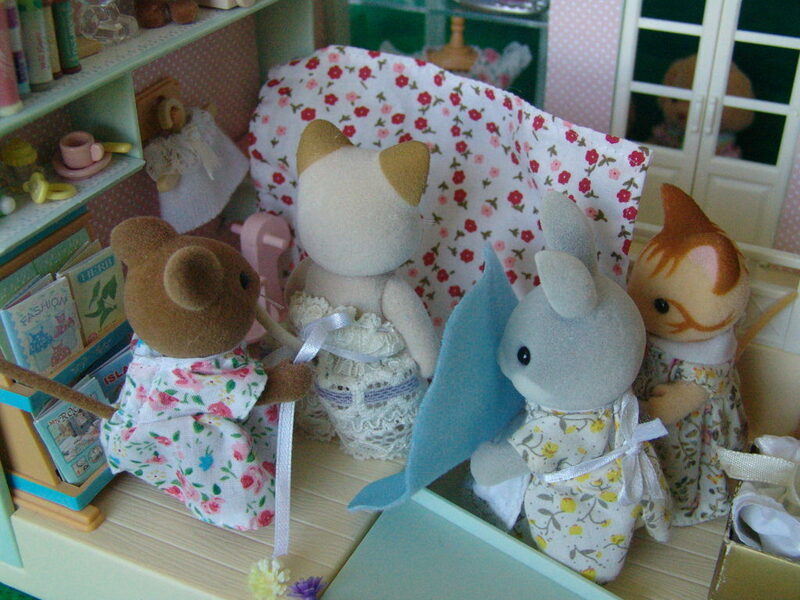 Evangeline would bring the box again when it was time for Primrose to get ready for the wedding. Tabitha flicked through the book and paused on a page on the West Woodland region, there was a page on beautiful places around Dandelion Creek. 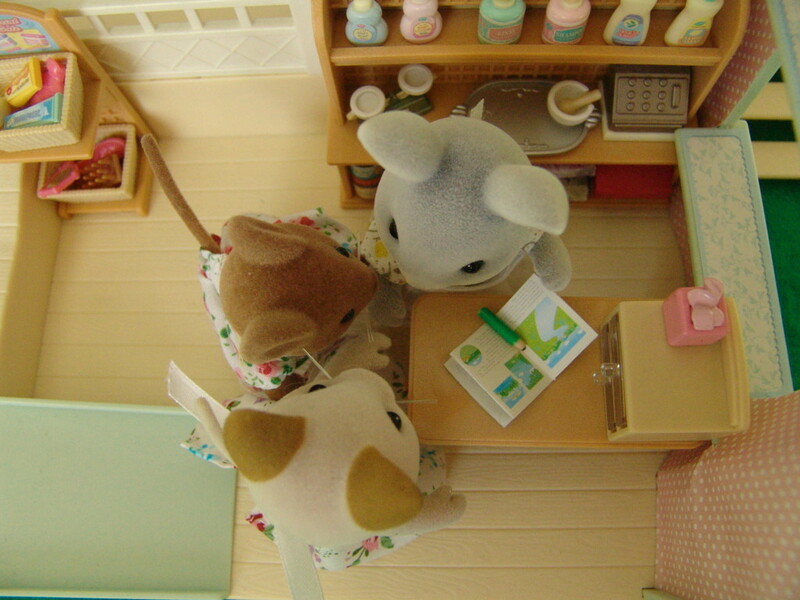 “Yes, I would recommend this one or that one” Tabitha suggested, pointing at two photos in the book. Sorrel got out a pencil and circled them. 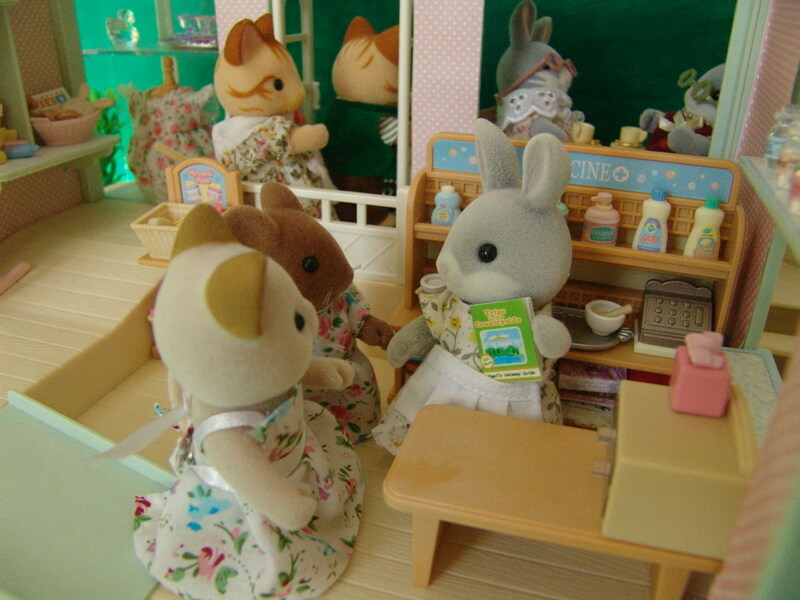 Sorrel and Tabitha looked at each other, they had a good idea why Patrick might be avoiding Primrose. Their husbands had hated getting fussed over while choosing their outfits for the wedding. Hello everyone! I had to get this posted if the wedding was going to be held before the winter. I have quite a few posts planned for the ‘wedding series’ and I don’t want to have their wedding in winter, it is autumn already. To think I wanted to have this wedding in spring! Lots of time has past since then! I can’t wait to read what happens next! Lovely story and wonderful job on the dress! Thank you Terra! I will post the second half to this story soon! 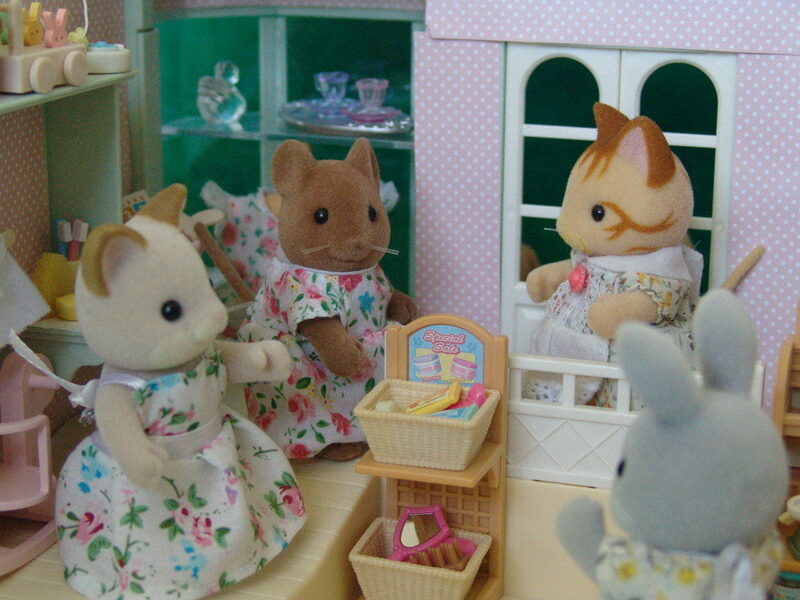 Great close ups of the country market, Emily! Thank you Nina! Christopher Cottontail is convinced that the tea makes him happier, that or the fact he is surrounded by his loving family all the time! Ooooh really looking forward to the wedding! I really enjoyed this story, Emily! I was looking forward to the wedding arrangements ! Choosing the perfect dress is very important. I´m sure Primrose will look stunning on her wedding day. By the way , the floral dress she is wearing is so beautiful, I love the pattern. Your pictures look great too! I´m glad you are back blogging again! I am really glad to be back blogging, it feels so nice to finally feeling a bit more creative and motivated to post. The floral dress turned out better than I thought it would, at first it didn’t look quite right.